Following the principles described in the About HWBOT Testlab article, we spend some time testing the new FM2-based mainboard from GIGABYTE. The F2A85X-UP4 is GIGABYTE’s most high-end SKU in the FM2 line-up featuring, as the PR reads, technologies such as Ultra Durable 5, Dual UEFI 3D BIOS, Digital Power delivery, triple display support and Lucid Virtu MVP. Over the course of two weeks, we tested the F2A85X-UP4 on several occasions inside the GIGABYTE headquarters. 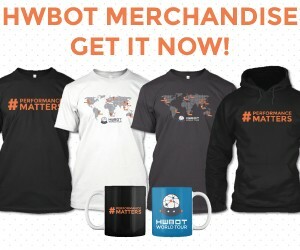 In the spirit of the HWBOT Testlab philosophy, we conducted our own testing with no interference of any of the vendor representatives, unless requested. 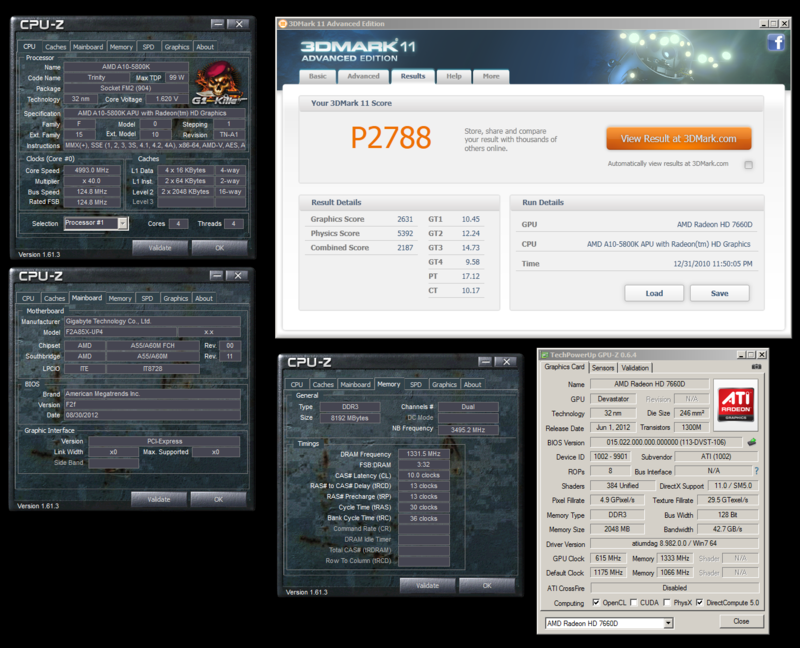 In this report, we will provide you as much information as possible on how to achieve the same P10002 benchmark result with the F2A85X-UP4. 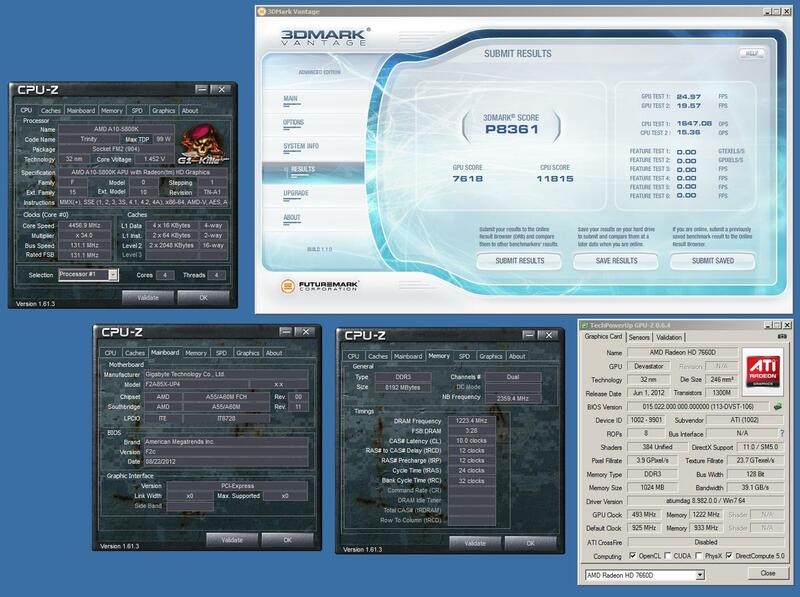 This includes the BIOS settings, test system details, BIOS files and a full run-down of all preliminary benchmark results. Enjoy! The flagship GIGABYTE FM2 series motherboard comes in the shape of the GIGABYTE F2A85X-UP4 motherboard, designed to push AMD A-Series APUs to the limit with GIGBAYTE Ultra Durable™ 5 technology. Digital power controllers ensure high capacity, high current power delivery which, when coupled with high speed memory support, combine to push the onboard AMD 7000 series graphics processor to the absolute maximum. The mainboard used was a PVT sample with PCB v1.0. The PVT sample is identical in lay-out and specification to the mass production samples, which means that the results, bios and settings provided in this article are compatible with a retail product. 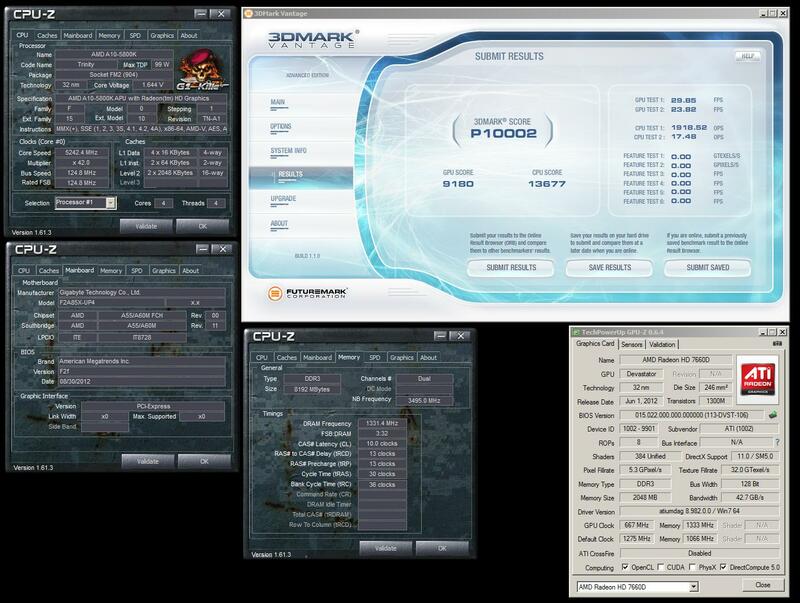 CPU-wise, we had 3 different A10-5800K samples available for our testing, but we only used two (#0003 and #0065). 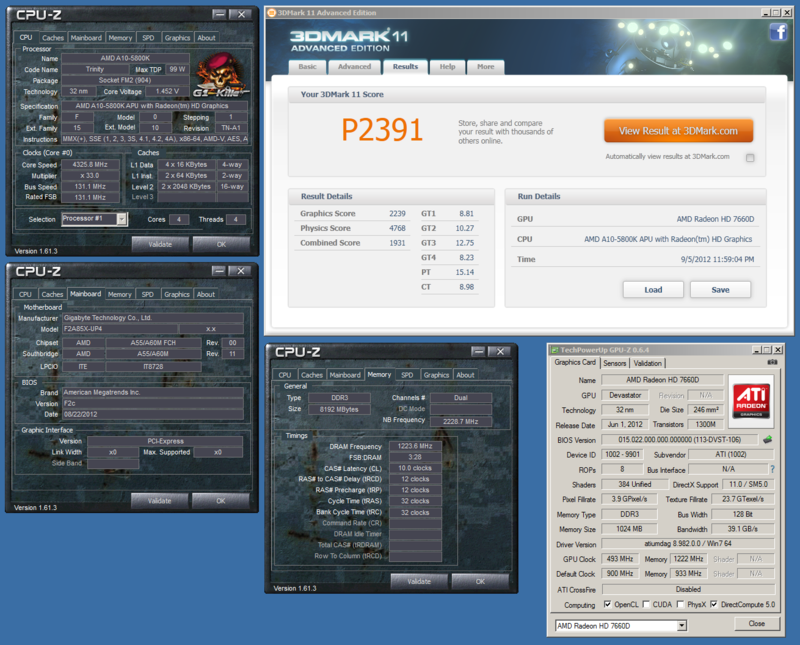 It was the second CPU that achieved the the Testlab Verified P10002. 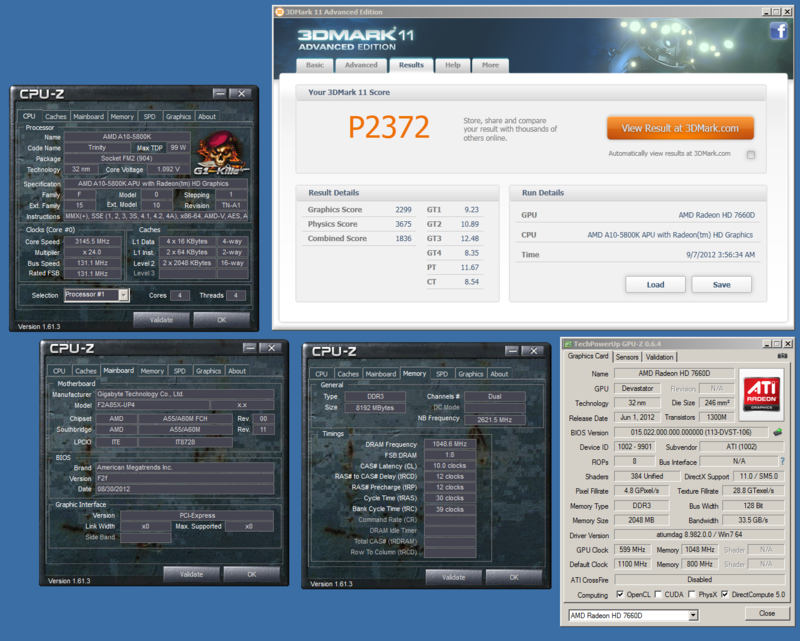 After a two-week testing period, the final Testlab Verified score achieved was P10002 in 3DMark Vantage Performance. 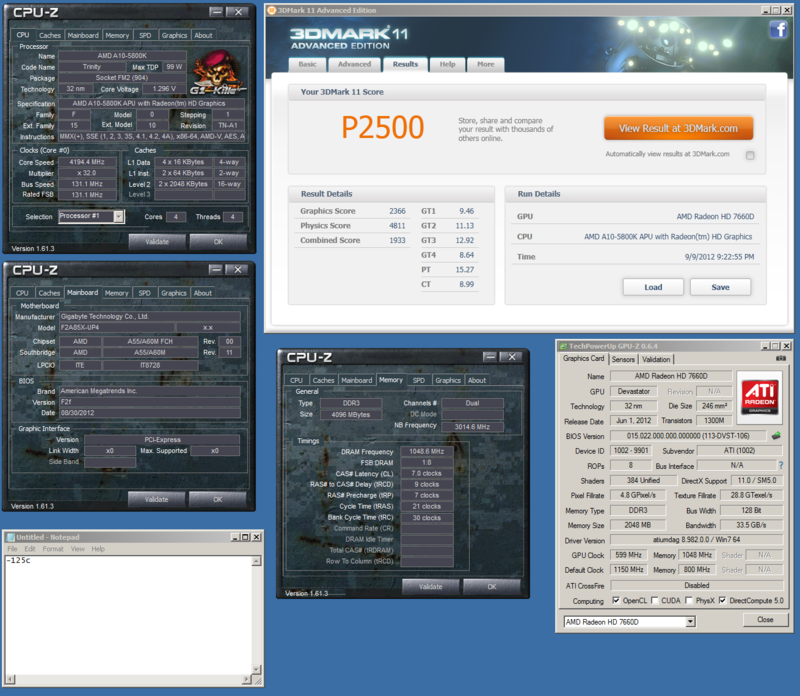 The CPU was clocked to 5242MHz, the IMC to 3495 MHz and the system memory to DDR3-2666 CL10-13-13-30. The IGPclk ratio was set to 1275MHz in BIOS which, multiplied by 1.241, results in an approximate clock frequency of 1.58GHz. 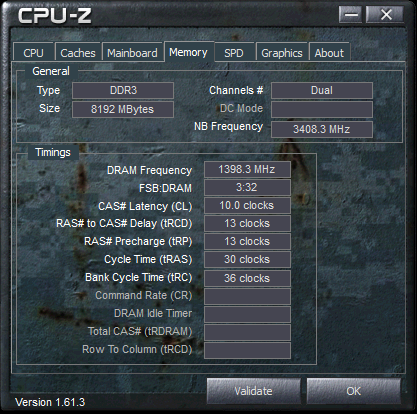 There is no information on the exact clock frequency as both GPU-Z and the BIOS does not give correct information on current frequency. Underneath you can find the HWBOT submission information and verification screenshot. 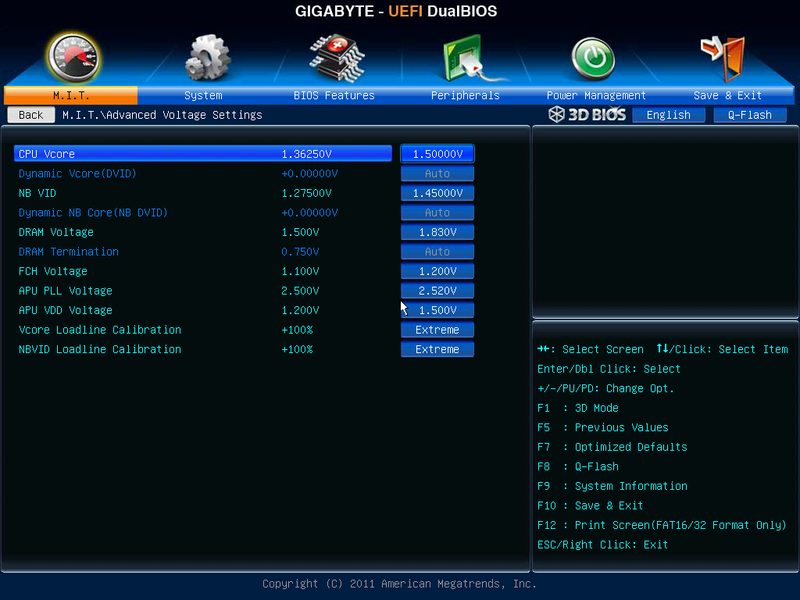 Using Q-Flash, we also saved the used BIOS (including OC profiles) for your information. Disclaimer: using any of the Testlab BIOS or related profiles is entirely on your own risk. 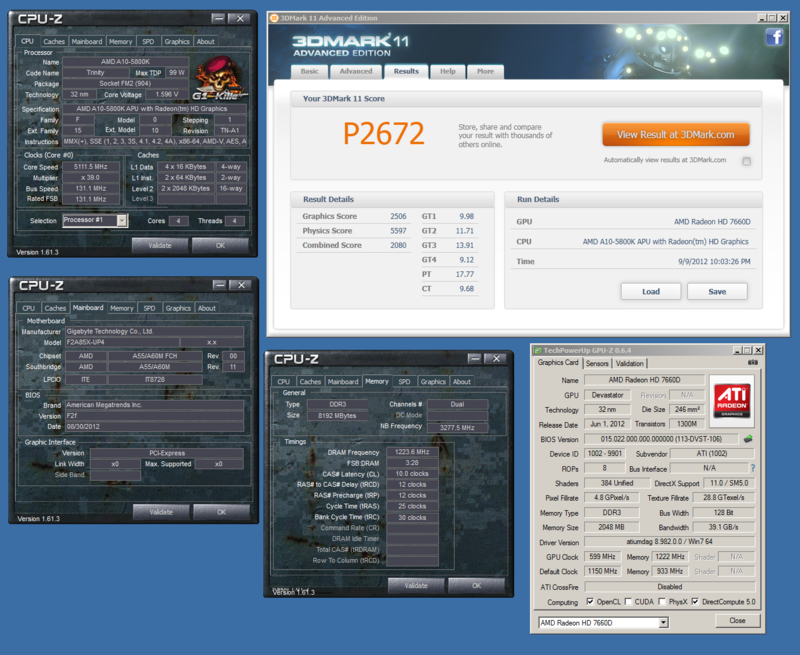 Most of the profiles are used for extreme overclocking purposes and are not for regular usage. Don’t try if you don’t know what you’re doing! 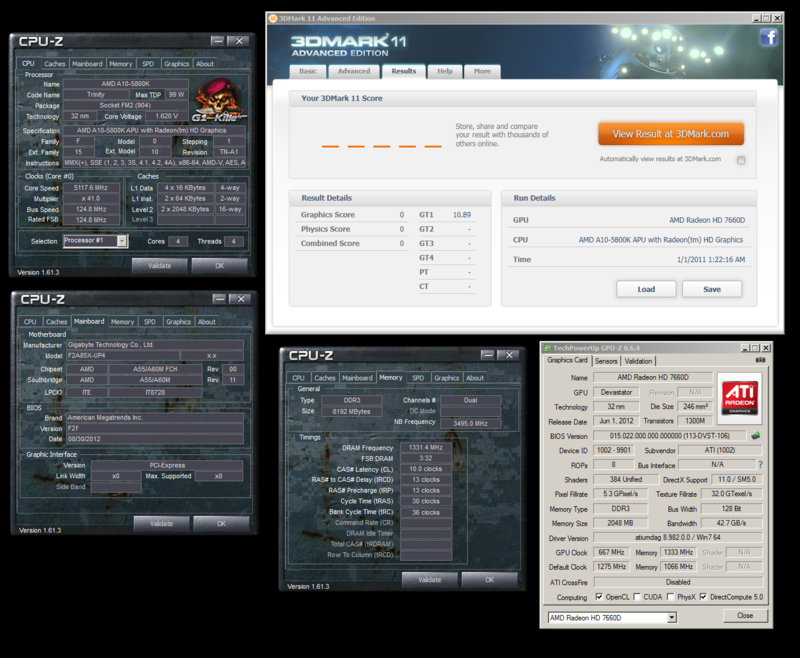 For this report, we have two sets of BIOS settings: one for air overclocking and one for LN2 overclocking. 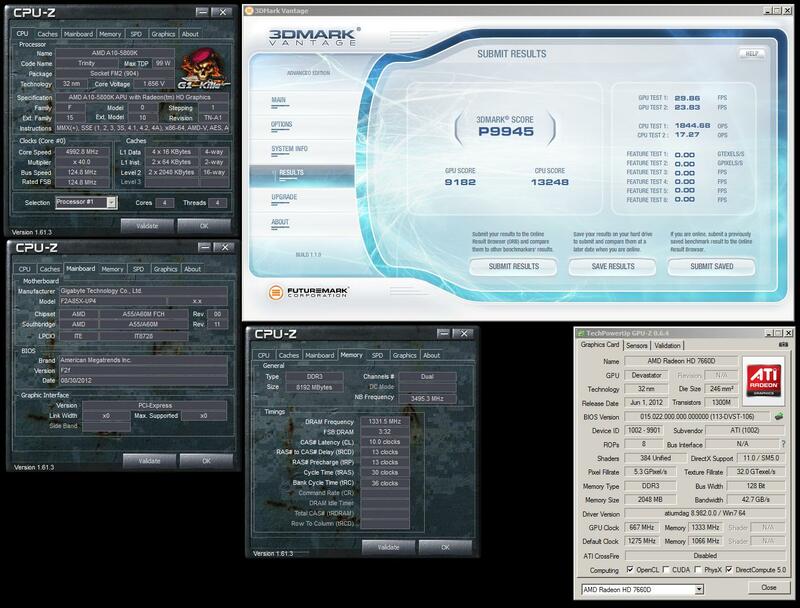 During our testing we obtained much more results than just the P10002 Testlab Verified one. For the purpose of full transparency, we like to share these initial testing results along with the final score. 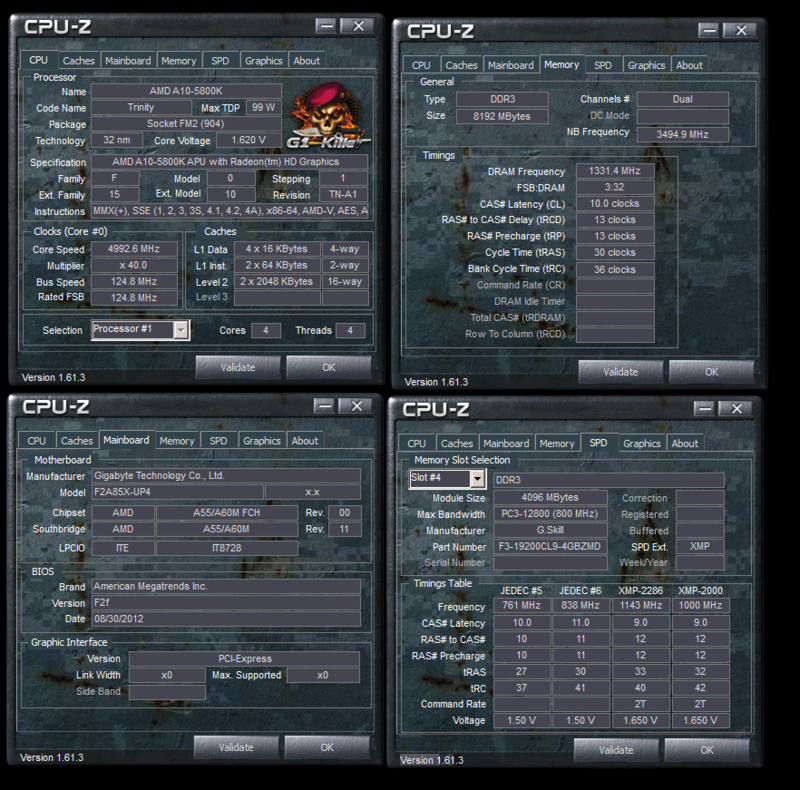 Hopefuly this will provide you with more information on the scaling as well as give you a couple of targets when doing your own overclocking attempts. 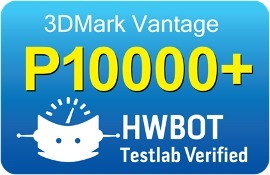 For more information on the HWBOT Testlab, please check our introduction page: link. If you have any questions or concerns regarding this or any other HWBOT Testlab report, feel free to get in touch through email or the forums. We are always interested in hearing constructive criticism and new ideas to improve the validity of the Testlab results. 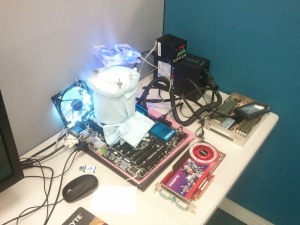 I thought these chips were hitting 7GHz+ on LN2. Is it because you were using the IGP that it didn't go any higher? The board is limited to 1.80V Vcore, if I remember correctly, and I was hitting about 6.5GHz on both chips with that voltage. 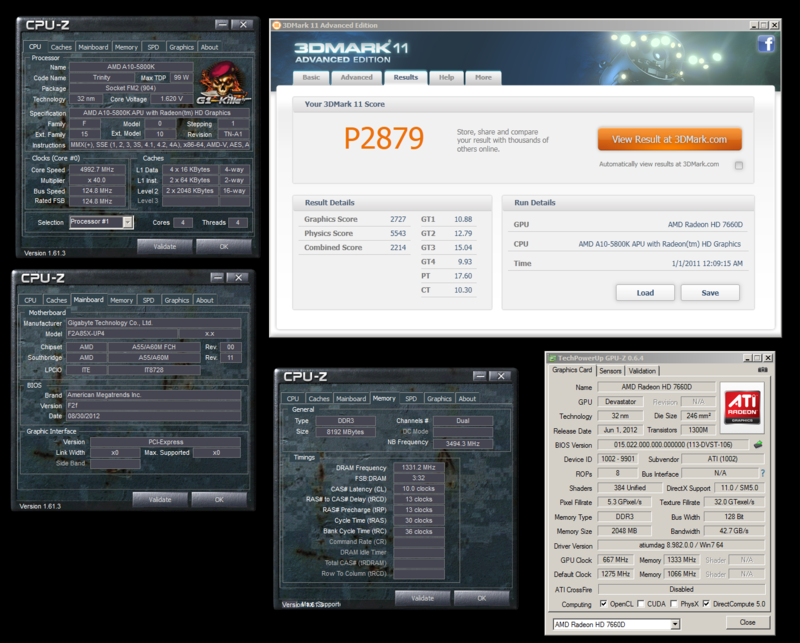 The biggest problem is that the APU will shutdown if you use too much voltage/frequency for either the CPU or the IGP. So, in order not to trigger the shutdown I kept the CPU at relatively low voltage and frequency. Besides, the effect of CPU frequency is almost insignificant anyway. 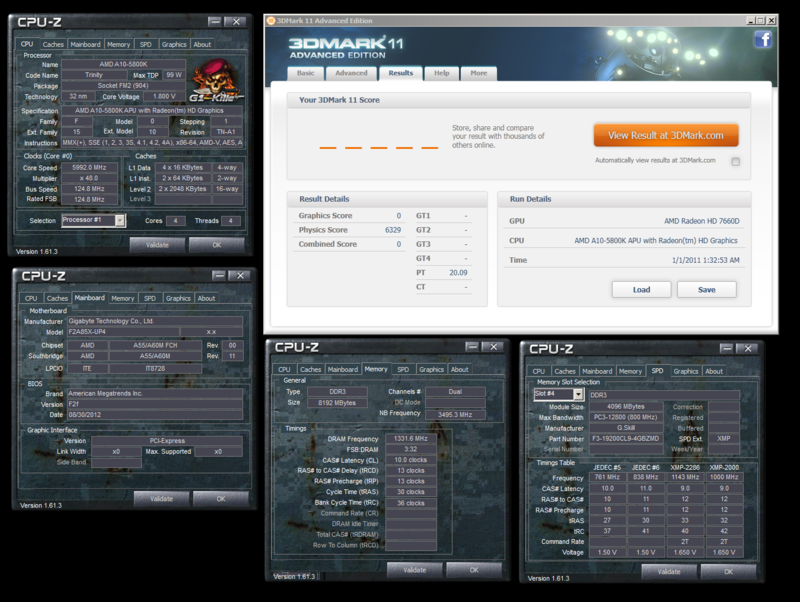 1GHz additional CPU frequency equals a total of 11pts boost in 3DMark11. Wow... I thought the Physics portion of the benchmark had a pretty large effect. Guess not! It's a balance-thing. 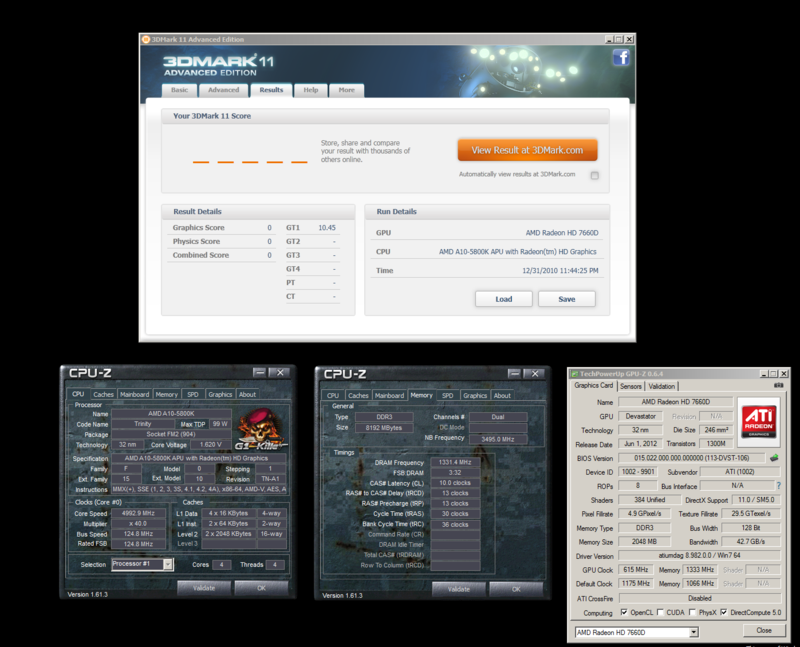 For the Physics score to have a large effect, you also need your GPU score to be high. 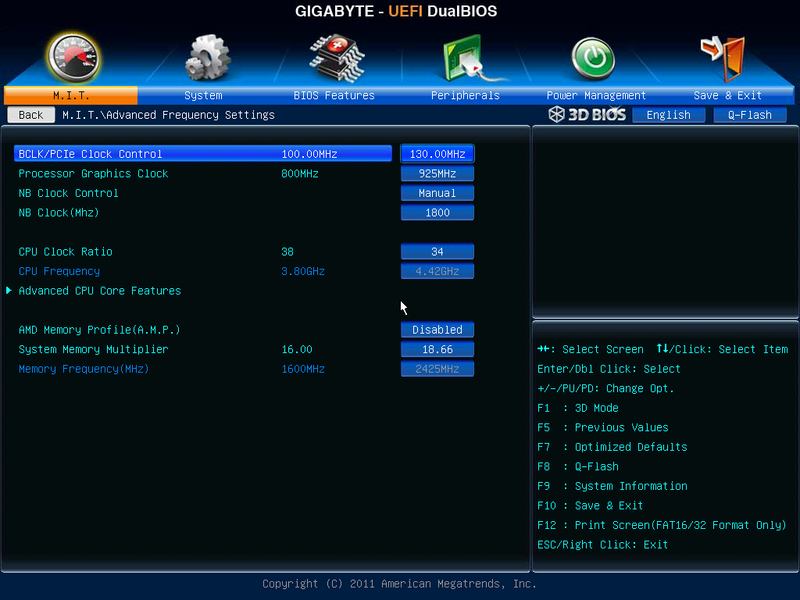 The biggest problem is that the APU will shutdown if you use too much voltage/frequency for either the CPU or the IGP. What is the strange issue? If the problem would be OCP, the system would just shutdown. This sounds like throttling in some way. How are the temperatures? If so it is most likely either VR_Hot (VRM) or CPU HTC activation (@ 70,0°C). Enable "PowerMode" with TCI K2 and see if it makes any difference. However it certainly isn´t VRM OCP. Also I can not go above the 1866 memory divider. If I used 2133 or above it doesn't boot anymore. Pretty much same settings / voltages like Pieter used in the first post. For high FSB clocks, you should try the 'even' memory multipliers: either DDR3-800, DDR3-1600 or DDR3-2400. Also set IDE, not AHCI. Thanks PJ. Gonna test it now. 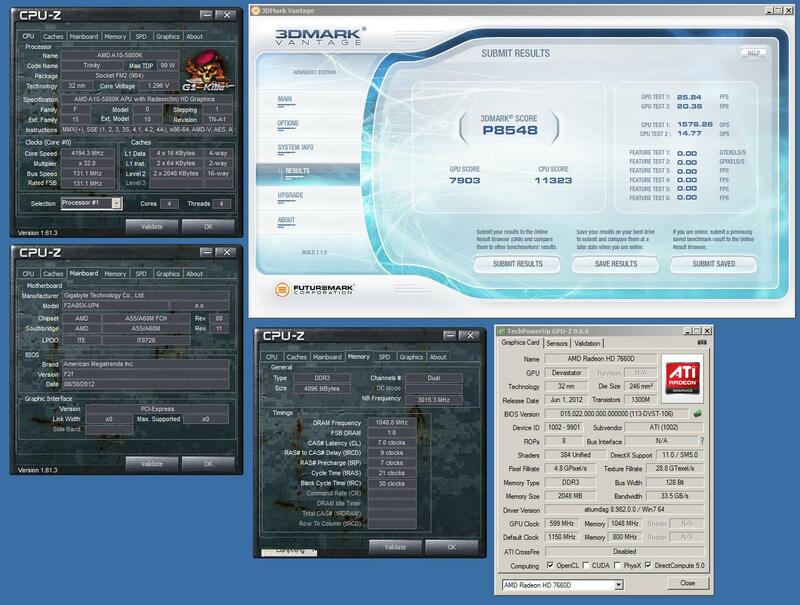 Around 170MHz -175 to be precise- was the highest the board could do with multiple CPUs. Afaik, it was related to the used clockgen (you could do a little higher fiddling with clock spectrum). The boot-in-windows issue is 99% IDE/AHCI related. Yes it was IDE related The memory issue was due to wrong subtimings. I had to set all the subtimings manually. Now I can also use 2133 MHz divider. I'm aiming for about 120-125 MHz BCLK for benching. According to Hicookie the board switches to the external PLL at 133 MHz like you said. Okay I'm realy annoyed now.. Spent 3 days to get the correct performance and to unbug the system with these crappy AMD drivers and when I just wanted to start the 2nd Lightning died out of nowhere on stock clocks. enabled PowerMode but doesn't change the situation.